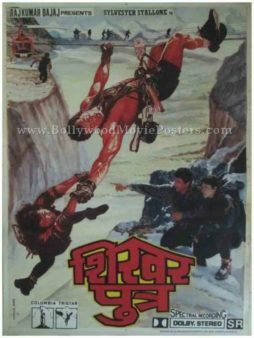 Classic Hindi movie poster for sale of the Hollywood movie dubbed in Hindi, Shikhar Putra: Cliffhanger (1993). 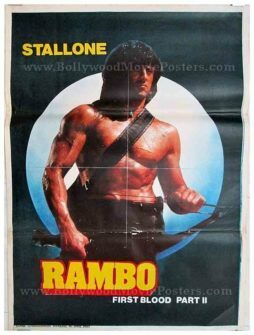 This is an actual surviving classic Indian film poster of the 1993 Hollywood adventure film starring Sylvester Stallone in the lead role as a mountain climber. Printed and circulated during the original Hindi release of the film in India (somewhere in the early 1990s), this classic Hindi movie poster for sale was designed for publicity of the film but never ended up being used. This classic Indian film poster was originally designed on a canvas board using a combination of both hand painted artwork as well as still photographic collage. Sylvester Stallone is seen in a brilliant hand painted rendition from a key scene in the film, dangling precariously on a rope. Still photographs of Sylvester Stallone and Janine Turner are seen at the bottom. The mountainous background is hand painted in this very unique classic Indian film poster for sale.